I'm a bit fuzzy on these concepts, If I build the same ToDo app completely in AngularJS and ReactJS--- what makes the React ToDo use one-way data binding vs the AngularJS's two-way data binding? How is this different from Angular? React doesn't have a mechanism to allow the HTML to change the component. The HTML can only raise events that the component responds to. The typical example is by using onChange. I made a little drawing. I hope it's clear enough. Let me know if it's not ! Two-way data binding provides the ability to take the value of a property and display it on the view while also having an input to automatically update the value in the model. You could, for example, show the property "task" on the view and bind the textbox value to that same property. So, if the user updates the value of the textbox the view will automatically update and the value of this parameter will also be updated in the controller. In contrast, one way binding only binds the value of the model to the view and does not have an additional watcher to determine if the value in the view has been changed by the user. 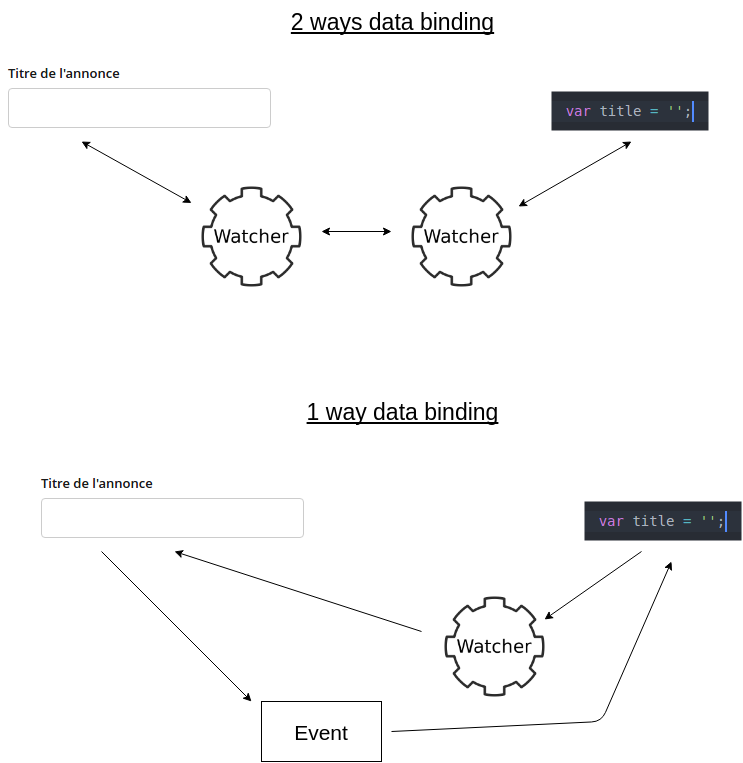 Regarding React.js, it was not really designed for two way data binding, however, you can still implement two-way binding manually by adding some additional logic, see for example this link. In Angular.JS two-way binding is a first class citizen, so there is no need to add this additional logic. React - component for every styled element? What's the most concise way to read query parameters in AngularJS?